There is plenty of motivation and energy for this race. Robin spent a year planning for and preparing other runners for this marathon. 19 friends (including us) are here in Napa psyched up and ready to take on the challenge together! And she'll get 21 more by the end of the year to reach her birthday goal of having 40 friends doing a marathon the year she turns 40. "40 @ 40". Being a part of this is very exciting. I have my own goal today of 3:15 (7:27 pace). My running partner, Troy, is also shooting for that so the 2 of us will work together. 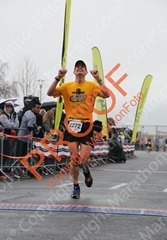 This was my goal at my 2011 marathon. I missed it by about 3 minutes. I've done the training correctly so it should be possible today. The weather is good, 50-55 and overcast. Robin & I & friends get on the bus for the start. We're a little behind arriving because our bus made 2 wrong turns. First thing to do.. stand in the porta-potty lines. Then assemble at the start for pictures. Wow! Everyone's here and appears ready. Richie Alesci finds us. We're excited to see if he can break 3hrs. Karen, Stephanie, Troy and Laura are here from the track. And many others. My main concern these last few weeks has been my left hamstring. I stretch it some more but it's feeling the best it has all month. After a group shot, a prayer, and dropping off our sweats, we line up and face towards Napa. An older age-group course-record holder performs a great National Anthem. It's followed by someone saying a type of "prayer". It's always important to us, especially at a race, to take time to pray, as our Savior, Jesus Christ, demonstrated in the Bible. We bowed our heads to honor Christ, but was the speaker honoring Christ? The prayer was about our efforts being good in our eyes and the eyes of those around us. Wasn't any mention of God or Jesus. At the end I hear Robin quietly say "..in Jesus' name." That was a good reminder that if we don't know who the speaker is praying to, we can still acknowledge who we are praying to. So, after that bit of awkwardness, and knowing God is with us, we count down and hit the road! Go! Richie disappears ahead. 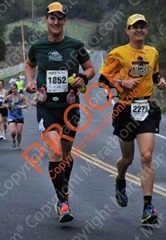 Troy & I move ahead of Robin & Karen, dodging a lot of slower runners. After a mile we've settled into a 7:25 pace. The plan is to start at 7:22 and slow to 7:27 by the 1/2 way point. We did our 20mi training runs around 8:50 pace so this does feel quite a bit faster. We're talking & joking & reflecting. Troy had a chronic injury up to 10 wks before this but thank the Lord it's been ok ever since. Still, it's a question mark. My hamstring is feeling fine! Thanks, Lord. Troy jokes that he thinks out of the 2 of us, Troy will win. But I say that Troy is stronger, although Troy does have more experience. It's a good laugh. We slow on the ups and speed up on the downs. Trying to maintain heart rate and stay relaxed. My body usually falls apart (hurts a lot) those last 6 mi so it's important to run as efficiently and smart as possible early on. The steep camber of the winding road is difficult on the legs. We don't want to run longer than necessary, we want to run the tangents. But that's the steepest, most uncomfortable part of the road. 5mi: (7:18 average) My Garmin isn't tracking with the mile markers. It's getting further ahead. About .01mi for each marker. It does have trouble sometimes. This means my pace may not be right so I switch to using the course markers to determine pace. That's why we've now gone down to 7:18 pace (according to the Garmin). 7mi: I'm drinking at each aid station, alternating water & sports drink (gatorade). I start to feel a little nauseous. 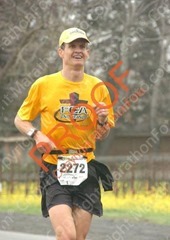 Immediate I recall the dreaded final miles of the 2011 marathon where my stomach was sick. It might be the Gatorade so no more of that. Just water. At 7.5mi it's time for a nature break - I run ahead, hide in some bushes, and then catch back up to Troy. This goes well and the faster pace isn't too hard to do. Troy keeps a very steady pace. 8mi: (7:20 average) Pace is scary fast compared to our 8:50 long runs. But the mile markers indicate 7:25 which is more on schedule. 10mi: At this point it should feel easy. I admit to Troy that it's not feeling as easy as I hoped. He feels the same. I'm very motivated and energized and don't feel like this will be a problem, but I am concerned that if I push the legs too hard, they will break down. Hamstring is still good. Feeling a little leg strain due to my feet moving in my shoes. I'm using different socks, some Sport Slick on my toes, and the laces might be a little lose. All this is making for less stability. I pray that Robin is feeling ok with her sensitive hamstrings. 11mi: 7:33 (7:22 average) Troy is feeling a pain in his knee. 12mi: 7:37 (7:23 average) We're slowing a bit too much. 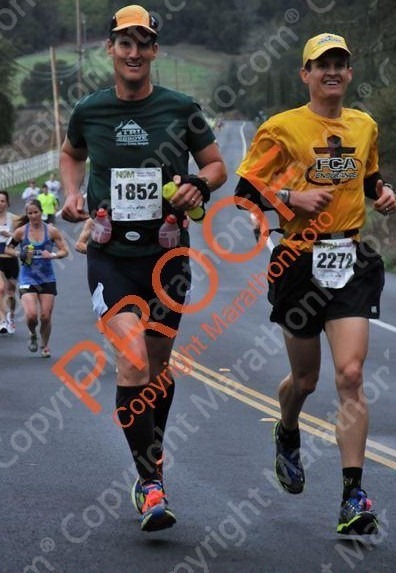 I tell Troy let's put in one more fast 7:20 mile before the 13.1 mark and then slow it down a little. 13mi: 7:33 (7:24 average). At the 1/2 way, according to the markers we're at a 3:16:30 (7:30) pace. Need to bring it down somehow..
14mi: 7:40 (7:25 average) I have to go again. I run ahead to the porta-potty at the aid station, and then run fast to catch up to Troy. Up ahead I see a woman with a very long-stride that's been running near us for a while. I ask Troy if he thinks we can catch up to her but he doesn't think so. I realize now that our paces are going to be different. It always helps me a lot running with Troy but it's best if we run our own race at this point. 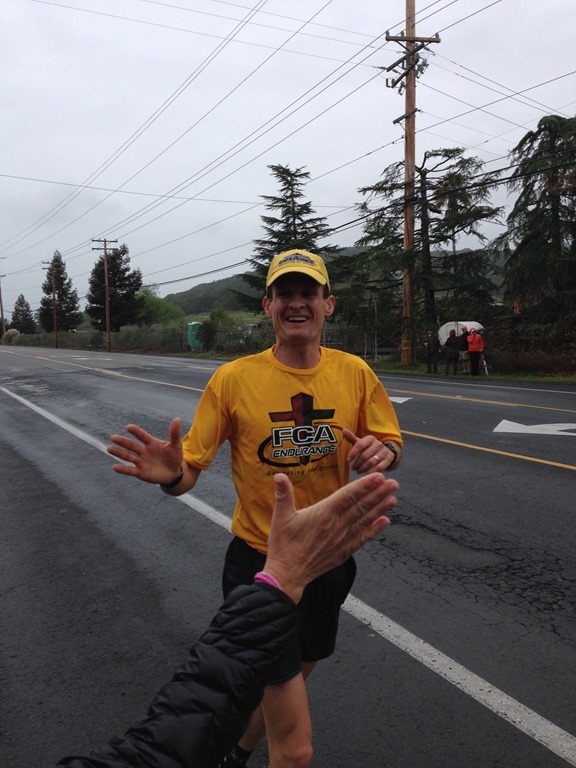 14.8mi: (7:26 ave) I pray for Troy's race. He prays for others in our group with pains. Then we part ways. He adjusts to a 3:30 pace and I still feel confident with the 3:15. I ramp up to 7:20 pace and push ahead. I talk to the "long-stride" woman briefly. She's amazingly relaxed for maintaining those big leaps. Up ahead I see Steve & Ann cheering! It's a great boost. 16mi: 7:23. Going good but after this little hill I need to pick it up more if I'm going to hit mile 20 in time (2:39) to finish at 3:15. Suddenly my right quad starts to cramp. A small adductor muscle on the inside of my quad is strained and threatening to go completely. This is not good. If it gets worse and goes completely, I'll be walking. Not only will my goal of 3 yrs be lost, but sub 3:30, or even sub 4:00. 16.7mi: I stop to quickly stretch the quad. The long-stride woman goes by. It's drizzling pretty good now as I work to catch back up while not straining the quad at the same time. The stretch didn't help. It hurts every step. I realize there is only one hope.. that if it's God's will, He'll keep it together and allow me to finish strong. I start praying continuously and trying to have faith. I try to recite Psalm 23 (Troy had brought it up earlier). Oh how I look forward to "laying down in green pastures" and resting after this is over. 19mi: Amazingly God is keeping it together and somehow giving me good 7:12 miles! I eat my 2nd Hammer Gel. I'm actually glad to be on the mile 20 hill. The leg hurts but if I can get over this, it's all downhill! 20mi: 7:12 (7:24 ave) Wow, so far so good! Just a little more to the top (which is at 20.3mi officially, or 20.5 according to my Garmin). Top of the hill! I stretch and try to massage the strained quad in hopes of flying down and making up time. But as I descend every step hurts worse then ever. On my own I can't imagine getting to the end with this pain. But God is faithful and I keep praying. I imagine it's a dream where my legs are moving and I can continue this movement forever. I try to distance myself from the pain. 22mi: The last 2 were 7:33 pace. I've changed my goal to 3:17:30 (to beat my 2011 marathon). I eat a banana thinking Potassium will help. 23mi: 8:00. Uh oh. This may be the best I can manage to the end. My legs are hurting or cramping all over. It's hard to smile. I see Steve and Ann cheering for me and it makes me smile. They're the only spectators around. After a high-5 and turning the corner, I suddenly start feeling a little better and push the little hill after the bridge. Thanks, God, maybe there is hope of going faster. I eat another banana piece. 24mi: 7:52. I'm thanking the Lord for making the quad hang in there. Now I think of many easy 2mi runs I've done so that this last stretch doesn't feel so bad. But the main strategy that works is to think of nothing else but the goal for the next mile. 25mi: 7:47. Yes! Just a final mile "at the track" and it's over. I'm hurting so much and want to stop. I'm hoping the course is marked wrong and will finish earlier according to my Garmin. I have complete faith now that God has helped my quad continue and that I should push harder.. it won't fail. There are more spectators and they're great. I'm pushing harder. My Garmin says .5mi left. The markers say .8 left. 26mi: 7:36 (7:28 average). Can't believe it, almost done. The pain is still there but the realization that God answered my prayers and hearing the crowds cheering helps me rise above it. I run as fast as I can. Every second is going to count… with a 6:50 pace for the last 1/2 mile (26.5 on my Garmin), I finish! 3:17:34. Thank you, Lord! For a while I thought all the goals were done. But I beat my 2011 marathon time and was pretty close to my goal. 6 miles ago, with the quad pain, I couldn't picture running the rest of the way, but God helped me do it. I just need to remember that, not just for marathons, but for any tough struggle in life - even if it looks impossible, God can bring me through with a surprisingly great ending. Rich Alesci M30-34 14th 2:59:21 Met YES! Troy Soares M45-49 12th 3:17:34 Close YES! Karen Nickel F30-34 11th 3:32:39 Close YES! Robin Soares F40-44 10th (17th Master) 3:32:50 YES! Michelle Ladcani F45-49 5th! 3:44:11 Exceeded YES!